After the easy-bake oven, consumer electronics has advanced by leaps and bounds with the introduction of Rotimatic – the world’s first robot that bakes fresh homemade roti, a flatbread that makes up the staple food diet of the Indian culture. Entering into this new age of cooking, this idea formed and expanded when Pranoti Nagarkar Israni, a mechanical engineer and her husband Rishi Israni, a computer science graduate spent S$20,000 to create the Rotimatic prototype which won the Singapore Start-Up Competition in 2009 alongside with financial support from investors in their startup, Zimplistic. Revealed by Tech in Asia, the Singapore-based startup company, Zimplistic since then has raised a staggering amount of US$11.5 million from NSI Ventures and Robert Bosch Venture Capital (RBVC) in their series B investment round held last July 2015. But moving to realize the Rotimatic faced various challenges as Pranoti Nagarkar Israni explained the difficulties behind converting the four physical moves of making the roti – measuring, kneading, flattening, and roasting to be fully automatic as well as compact and affordable. Though it took them 8 years and US$14.5 million, but Rotimatic was finally brought to reality and ready for shipment to the Singaporeans and United State citizens that have pre-ordered the product in 2014. With the pre-orders numbering more than 8000 orders at the retail price of US$999 per unit, Zimplistic has already bagged US$ 5 million worth of sales. Making one roti every two minutes, Rotimatic has thus revolutionised the way the Indian cuisine can be made. With the machine, people can skip the hard work behind the process of making roti as users now only have to add in the ingredients and push a few buttons selecting the preferred thickness, softness as well as quantities to enjoy a delicious meal of roti. 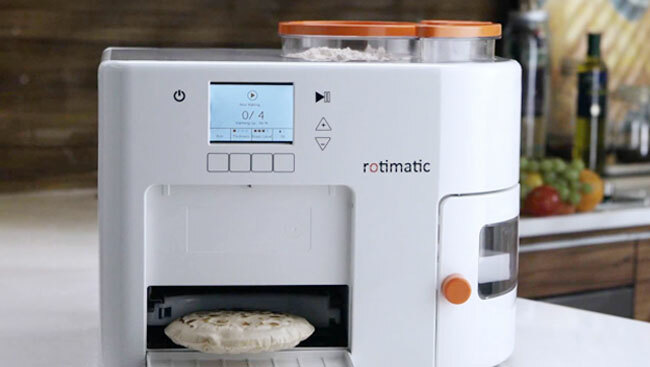 Rotimatic is the world’s first robot that makes fresh homemade rotis and wraps. The idea dates back to 2008 as co-founder Pranoti Nagarkar Israni found making roti, from the process of kneading the dough to cooking it at the hot stove, to be tedious and time-consuming. As a solution, she created this fully-automated roti-maker that can now cook up to 20 rotis in one round using less than 30 minutes which only requires the easy steps of adding wheat flour, water, and oil and pushing a few buttons.